The Wii U is far along in it’s lifespan now that we are beginning to see smaller digital releases for the eShop on the platform. Much like the Wii, these have been a bit hit or miss, but after seeing the likes of Trine 2 and The Cave make the transition smoothly, there is more potential here for developers to truly shine. As many of you know, Kung Fu Rabbit was released a good while ago on the iOS and was rather successful despite it’s “freemium” styled set-up. Neko Entertainment have now provided us with a port on the Wii U, with no unnecessary spending or touch gimmickry attached. Does this title from a much different market stand a chance on the console, or is this one rabbit with a distorted vision? Let’s find out. I won’t be speaking about the story much with Kung Fu Rabbit, as while present, it is minimal at best and the only thing you need to worry about is making it to the next stage. Just like it’s iOS kin, this title places the player in the role of a little bunny with some serious fighting skills who is going after alien scum. Levels are made to be small, with only a section to be played at a time before moving on to the next. You know those type of games that break down what could be one giant world into forty short stages? Well, this game is like that, but without the moments of interruption inbetween. 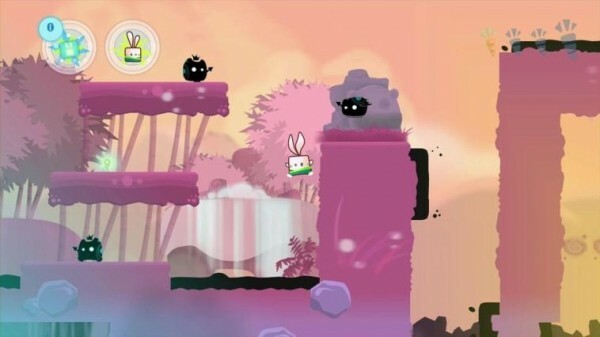 At it’s core, Kung Fu Rabbit plays as a quick, side-scrolling platformer. Our furry friend must jump his way to the end point of each level while avoiding obstacles in order to progress onward, and starting off – the game gives off the illusion that things are simple. That alone is a lie, and this rabbit will break you if you don’t have reflexes of steel. 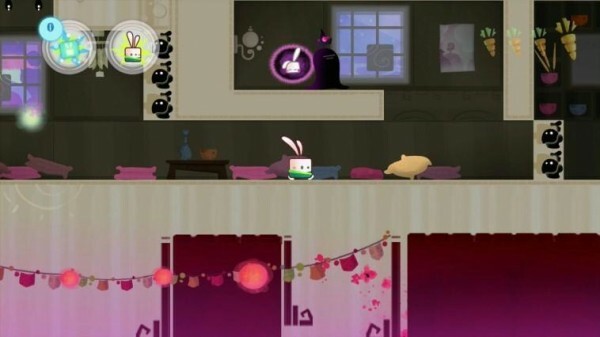 You see, Kung Fu Rabbit plays a lot like Super Meat Boy. Each level is set up with a good number of hazards littered everywhere, with enemies also pacing back and forth waiting to stop you from moving on. 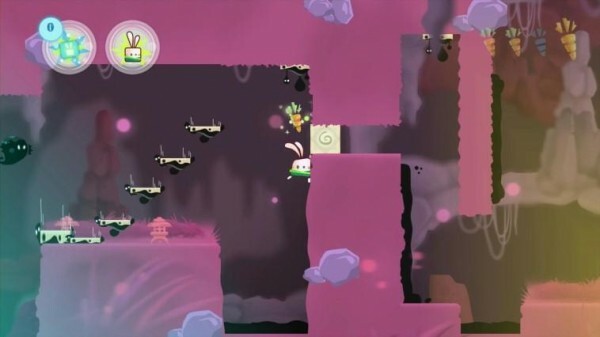 The hazards themselves appear as tar that kills our rabbit at the touch, clinging to the edges of walls and platforms so that players will have to use precise platforming in order to stay safe. Carrots act as a reward for each stage, and truly finishing each stage means that you collected all four during the run. Sounds simple enough, right? Wrong. These carrots are put right above a pit death, at the feet of an enemy, or at the edge of a cliff, so it’s actually more of a test of skill for those that want to collect everything in each level. With this precise platforming and tricky enemies to defeat, most will be happy to know that the button-control layout comes off as smooth and fluid, where every death is essentially your own fault if it does happen. After defeat, the player must start the stage all over again, but that in itself isn’t much of a problem as the stages are rather short to begin with. Personally, I am not a fan of “trial and error” styled challenges. That was the main problem I had when it came to enjoying myself with this game, and my own personal preferences made the later levels quite grueling and tedious. Before I hear “then why did you review it!” due to that statement, hear me out. I love platformers of all styles, but when you replace a true challenge with a test of memory or attempt to punish the player for their own curiosity, your game loses the spirit of its genre. This is not just Kung Fu Rabbit I am speaking about either. In my opinion, platformers are meant to be an odyssey into the unknown. Remember when we found secrets in Donkey Kong Country due to a bit of experimentation or discovered a legendary flute in Super Mario Bros. 3? Those titles, along with many others gave us the freedom to enjoy the world we were placed in. 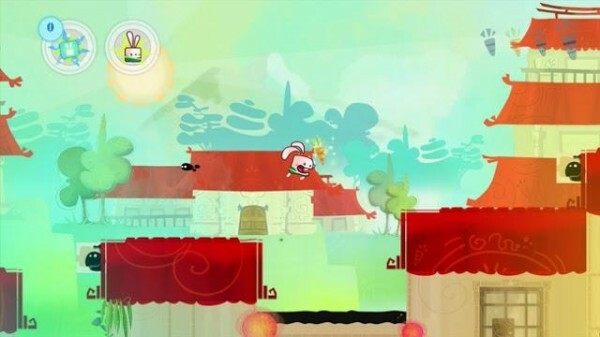 Kung Fu Rabbit features a lovable little mascot and a beautiful world, but limits the experience with artificial challenges made up of trial and error. There is a big market for this style of gameplay, but I would be lying to you, as the reader if I said I enjoyed it. Having an enemy kill you because its hit box is one pixel wide is frustrating, and utilizing wall slides and quick jumps excessively begins to feel repetitive and grinding as the challenge grows. Now, there are options to assist with this difficulty. In the original game, players could use their in-game currency – or carrots, to purchase items that have the ability to create a checkpoint, wipe out all moving antagonists on a stage, or provide a special power, but these only come when you have enough saved up and even then do little to curve the difficulty of the main game. Don’t get me wrong, with controls as tight as these and a well thought out level design, nothing is impossible and beating a tough stage is rewarding, but in a title designed to punish the player, seeing ten even more grinding stages ahead is enough to sit that Gamepad down and take a break. As I said, I understand many out there love these types of challenges in platformers and respect that. Kung Fu Rabbit however is less of a platformer and more of a test in patience and proper reflexes. Sort of like a complex puzzle game, if you will. The world of Kung Fu Rabbit is one filled with color and pure happiness. Maybe that is why I was eager to explore and enjoy myself – only to find disappointment as the fun was put on hold in order to perform timed jumps over and over. Our rabbit himself is also utterly charming with is squared body and large mouth, making it easy for players young and old to get behind. It’s almost like your watching a cartoon set in a Chinese painting, and for those that do enjoy the challenges that approach, you are sure to take in the rich atmosphere attached. The soundtrack however leaves less to be desired. 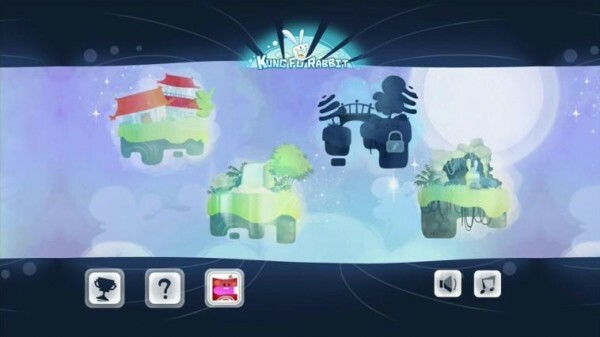 Sure, the oriental themed tunes do well to capture the environment and go along with the theme of the game, but they are looped – which means you will be hearing the same tunes restart as you make your way through the levels. Maybe this was done so players would try to aim for a better time, but with such a beautiful art style, it’s a shame we don’t get more in the music department. Now the sound effects, well – they almost redeem the entire experience for its melodic shortcomings. Sure, the little jumps and attacks sound good, but it’s the “pitter patter” of our protagonists footsteps that add in a ton of charm, making this hero extremely lovable. I review a lot of titles here at Capsule Computers, but it has been a long time since I have been so torn on with my final thoughts for a game. On one hand, Kung Fu Rabbit is built with a tight, easy-to-learn control scheme and a genuinely interesting setting. On the other, you have a game that makes you feel as if puppet strings were attached at the start of the experience, with every movement made coming off as predetermined and the high challenge only presenting itself due to one straying away from the developer’s forced intentions. Kung Fu Rabbit is not a bad game at all. Some in fact may praise the precise platforming involved as at it’s core, you have a game that resembles Super Meat Boy and I Wanna Be the Guy. Fun in a video game is very subjective however, and those who are looking for an afternoon of exploration and wonder rather than a test of skill and memory are better off giving this little port a pass.